My book of the month…. Foody Friday, and Mario Blanket up date. Lots to cover in this post and I only have a few minutes to write it… yikes! Lets start with the Mario Blanket update…. I have finally finished all the squares for my fiance’s Christmas present. Click the link above to see progress if you haven’t been following along. Over the next few weeks I will be sewing the loose squares together. oh joy! Tonight is date night so I am making bread bowls and potato soup ( see yesterdays post ). It is my first time making either so wish me luck! I will post all pictures this weekend. Its all coming back to me…if I want it to or not! For a few weeks now I’ve had an itch. An itch to make jewelry again. I stopped earlier this year to put all my focus on my crochet business. I don’t regret that, I love to crochet. I was quite good at the jewelry thing. I started in 2006. I lost passion for it in 09 when I lived in Florida. I was mostly focused on my bath and body line. Thats how I payed my rent. I had my stuff at a local boutique that was mainly soaps and such. When she went out of business in August 09 , I couldn’t afford my rent so I lost my apt. ( I talk about that more here ). I was living pay check to pay check. It sucked! I got back into jewelry when my mom was diagnosed with Brain Cancer. I made bracelets to raise money to help with travel back and forth from the chemo center she went to which was 45 minutes away from where she lived in Florida. I was in Ma. and my step dad was a tucker so he wasn’t always home to bring her. So she relied on her sweet neighbors and a car service . My popularity faded thanks to facebook and their changes sometime in 2012. I was still making and selling jewelry on Etsy and FB but comments and sales were down . I know I was under selling my work. I like my work to be affordable . I was using beads I bought a few years back since jewelry supplies were a bit on the expensive side and I knew I wouldn’t get what I should of. So I put all my focus on my crochet business and it really hasn’t payed off. With no car of my own I can’t get to craft fairs so I have to rely on my etsy shop which is profitable during the Halloween season and a few times during the year. 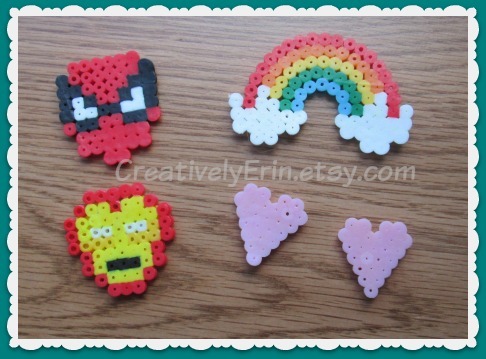 I’ve been playing around with perler beads ( melty beads ) lately . I made Christmas tree earrings and and pendant.All I need to make it a necklace is some chain. And dammit , I don’t have any.. 🙂 So that means I need to take a trip to the jewelry aisle. Walmart is closer than Jo-Ann’s and cheaper. And goodbye (for now) NaBloPoMo. I have come to realize that I can not blog everyday for a month. A bunch of my posts are mostly pictures. Oh and I missed 1 day. I thought NaBloPoMo was a once a year thing like NaNoWriMo. I should of looked in to it more before I committed to both . BUT I did finish hand writing my novel. I just have to type it up and have it validated. That’s not a big deal to me. I know I finished it. This past month I learned blogging daily is hard. Unless you have something to talk about. I did not. I don’t write how-to, or reviews. BlogHer had daily prompts but I wasn’t too fond of some of them. I want to do this again , using the prompts. Maybe in January. My Big Bang guest spot..I wish!! Finished Friday: A New Obsession! I feel like a kid again. I love being crafty! I received a melty bead kit in a October/ Halloween swap on Ravelry ( among other wonderful things my partner sent me). I instantly wanted to make something with the kit. Once I read the directions I noticed I needed an iron… which I did not have at the time 😦 I thought I could melt the beads in my toaster oven. This past Sunday I went to Ocean State Job Lot and bought a $10.00 iron. YAY! I tried to make a few things that night…. problem 1- peg board that came with the kit was too small. So I made a simple heart, I ironed it and a few of the beads didn’t melt. big FAIL. bummer. My fiance wanted to see a friend of his who works at Walmart so after lunch we headed there. I needed a skein of yarn to finish his Mario blanket so I went over to the craft section . Grabbed my yarn and saw a bucket of melty beads at the end of the isle . AWESOME. over 4,000 beads for $4. I also grabbed a few of the smaller peg boards since they didn’t have any of the big boards. 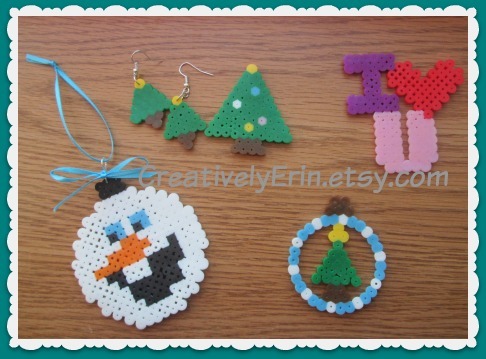 ( ordered some on Amazon along with other colors that didn’t come in the bucket o’ beads- dark blue, peach and gray). Here are a bunch of finished projects… more to come.